Q? I have been working with the hotel salesperson for months, but still feel we should meet just before the reunion to go over details. What do you suggest? A! Your instincts here are dead on – the planner (or committee) should most definitely schedule a “Pre-convention meeting” with the hotel salesperson handling the reunion. This is known as a “pre-con” in hotel lingo, and ideally should take place approximately three to four days before the first day of the family’s reunion. Any further in advance, and much of the information will be lost; any closer to the start of the reunion, and there may not be adequate time for the hotel to address issues. Ideally, a pre-con meeting should be held on a Monday or Tuesday afternoon for a reunion beginning on Thursday or Friday. In addition to the planner/committee and your hotel salesperson, the following hotel staff should be at the meeting: representatives from the front desk, housekeeping department, kitchen/culinary team, banquet department, restaurant(s) and the General Manager, if at all possible. The salesperson will assemble everyone for you; you don’t have to contact them yourself! Are you still expecting as many people as when you last spoke with your hotel representative? More? Fewer? The hotel must know this! Provide the housekeeping department with names of those who will require special items in their rooms: rollaway beds, cribs, or refrigerators for medicine. Hotel staff will attend to these requests prior to your arrival. Let the front desk know if a member needs a handicapped-accessible room, or one near the elevators, on a low floor, or some other special request. These “special” rooms can be reserved specifically over your reunion dates. This also applies if a family “VIP” is to be upgraded to a suite or other special accommodation. If you’ve chartered a motor coach to take your group sightseeing, to your picnic, etc., inform the hotel about this so arrangements can be made for loading and unloading at an appropriate spot outside the hotel. If you are providing “welcome bags” or other gift items for attendees at check-in, will you need a registration table(s) or will welcome bags be handed out by front desk staff? Review these details. Does your reunion have a banner and/or signs announcing your reunion? Discuss where these will be displayed. Review rooms the hotel has assigned for your hospitality room, meeting room, children’s room, and (most important) your formal dinner. Are they still appropriate for your functions? Will the hotel keep any of their facilities (i.e., swimming pool, restaurant, lounge, etc.) open extra hours for your group? Be sure everyone is on the same page with changes. Review menus for your formal dinner and any other meals you have scheduled. Are menus correct? Is a special item to be served? Are there favors, programs, centerpieces, or other special items that must placed on tables? Are you dancing at your formal dinner? Will you need a dance floor or stage for a band or disc jockey? How big must it be? Will you need a microphone and/or projection equipment to show photos/movies/videos? Do you plan to display scrapbooks, photos, or other memorabilia? Can the display area be locked when not in use to ensure family keepsakes do not “disappear”? If family members will be dining in the hotel’s restaurant(s), what time do they want to be served? If 150 people descend on the hotel’s restaurant at 8:30 on Saturday morning, expecting to eat a full breakfast in 30 minutes prior to departing to go sightseeing, the restaurant may not be able to accommodate that many people at once. Discuss mutually agreeable seating times. Likewise, if folks will want to dine together at larger tables (six or more people), let the restaurant know in advance, so they can be set up and ready. Will you have meals (i.e., a picnic) out of the hotel? If so, let the hotel know to not to expect your group for lunch! Does anyone in your group have a special medical condition the hotel needs to be aware of (heart problem, epilepsy or mobility issues)? Are members bringing pets? Review the hotel’s pet policies and procedures. And, if you haven’t done so already, obtain the names/addresses/phone numbers for nearby service providers that your group may require (i.e., nearest grocery store, 24-hour night pharmacy, house of worship, shopping center, emergency care center, party supply store, etc.). Obviously, you will have discussed many of the points noted above with the hotel salesperson months before, prior to signing your contract. Nonetheless, you’ll want to review everything again, to ensure that hotel staff knows what to expect, how much and how many to expect, and when to expect it. 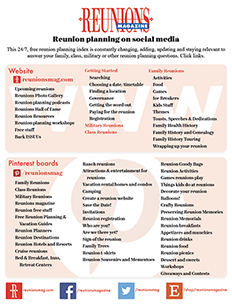 With good communication and foresight, any surprises at your reunion should be happy ones! Next Article Hospitality Room: where everyone gathers!